I wake up wanting a coffee, or tea, full of creaminess. I seem to drink coffee more in the summer and tea in the winter. Coconut Oat Vanilla Nut Vegan Coffee Creamer is always a winner and great in Earl Grey tea. I certainly have a few favorite store-bought creamers I like, but I love making my own vegan coffee creamer. A wonderful benefit of making your own creamer is that you can use any sweetener you want. Today’s recipe comes from my book, OATrageous Oatmeals. This creamer is quick and you can make it without going into the cold. This recipe will show you that having oats in the house is just as important as bread in a snowstorm! There is no need to soak nuts ahead of time which is why this recipe is perfect if you woke up this morning and realized you were out creamer. Just throw some oat and coconut in your blender with some water. 10 minutes later blend and strain, then add your favorite sweetener and flavorings. You can even leave it unsweetened and plain – it’s all up to you! This creamer gives you the same fun flavor without all the fillers. You can play with the extracts you use to change flavors. Break the oats and coconut into tiny pieces with your blender. Add the water and let soak for ten minutes. strainer over a small bowl to strain out the oat pieces. Put the liquid, sweetener and extracts back in the blender and blend until the sweetener is incorporated and dissolved. How can I substitute coconut? You could use all oats (1/2 cup) or sub soaked nuts like almonds or cashews for the 1/4 cup coconut. Looks as though there was a glitch in the instructions–for how many minutes do we soak the oats and coconut? We just ran out of coconut milk creamer, so your timing on this recipe is impeccable! Thanks! Ten minutes – sorry the recipe program stripped it out! 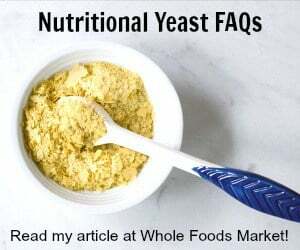 I try to use it up in 2 to 3 days because oat-based milks/creamers separate faster. If you have it longer than that it won’t be bad (maybe 4 to 5 days), but you’d need to reblend it. I can certainly see why this is so incredibly delicious. 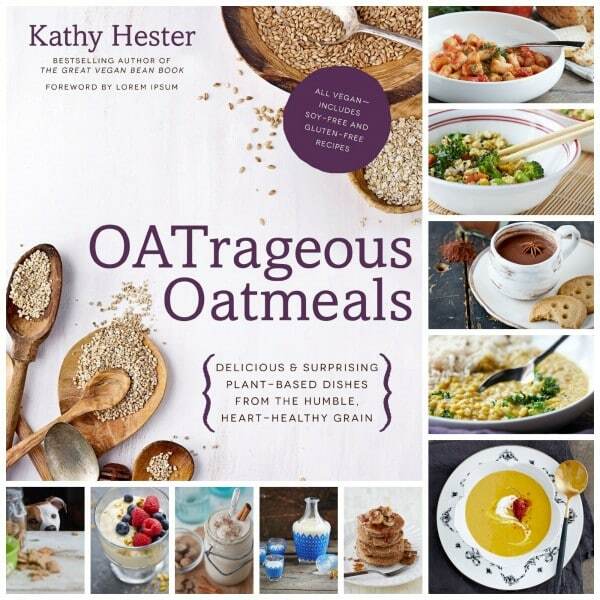 No surprise to me…Kathy’s book is OATrageous!! Oh thank the Lord! This was the one bit of dairy I could not give up… my Half n Half because I hated every non-dairy milk I tried in my coffee and could not drink it black either. I just made this and I’m quite satisfied so tomorrow I’m passing my Half n Half over to someone else now that I have a plant-based solution! Thank you for posting this! P.S. Since it’s made from oats and coconut, do you think this would be something safe to transport in a little bottle when I go out (for using in my coffee in restaurants)? I think it should be okay if you just take what you need out and leave the rest in the fridge. I was like you until I discovered Nutpods. I order mine from Amazon. They also have hazelnut and vanilla flavors. I order the classic and hazelnut flavors and they are delicious. I tried everything before finding Nutpods and was not pleased with any of them. Nutpods is creamy, like half and half…it is the best all nayural non-dairy creamer out there. Additionally, it is not sweet, which I love because I don’t like sugar in my coffee. So, when you don’t have the time to make this delicious recipe, try Nutpods…I think you’ss love it! It should do well, but I haven’t made ice cream with it before. Hi Kathy, LOVE this recipe but have a quick question to ask you. As a tea drinker, what do you use in your tea? I am currently using bought soy milk but would love a good milk alternative that I could make myself that wouldn’t be too watery as I like my tea strong. I can’t handle black tea (even very weak) and a good, reasonably priced milk alternative would be like gold. I love unsweetened vanilla soy milk in my Earl grey tea, but I do either a homemade plain cashew creamer or Califia Farms creamers if you are oksy with sweetener in your tea. I hope this helps! Just got your OATrageous Oatmeals book for Christmas and already earmarked so many recipes to try. I thought I’d start with this one and have one question. I was wondering if it’s possible to use steel-cut oats in this recipe by first grinding it into fine powder, soaking it overnight (I prefer to soak my steel-cut oats before cooking) and then cook them for 10 minutes or so until thicken. I’m not sure what consistency the creamer should have, but am I correct in assuming it should be similar to heavy cream (whipped cream)? I was hoping that I can then blend 24g of coconut butter to this ‘slurry’ once it cooled slightly. My thinking is to try and eliminate the straining and thus wasting of the oats. You could use ground steel cut oats and make the recipe as is. WIth that said I encorage you to experiment. Be careful about how much you cook them because it doesn’t make a great liquid after they have been cooked all the way. Thanks for the quick response, Kathy. I made a test batch, cutting the recipe by half. I ended up adding extra 30mL water to compensate for the loss of water during the cooking and soaking (the flour was soaked overnight). I heeded your advice (thank you!) and didn’t overcook it. The coconut butter (homemade from fresh coconut) added a really nice mouth-feel to the final product. It turned out incredibly creamy and thick – WOW! I’ve been using it in my tea (I like my tea very ‘milky’) and it felt just like drinking it with cream. I think next time I’ll try the London Fog Hot Tea recipe, and omit the coconut butter and compare. I suspect I may need to reduce the amount of oats in many of the recipes, since I need to cook them first before we can eat/drink them. I made a test batch of the Easy Oat Milk Yogurt, cooking the oats without straining. It turned out very thick before going into the yogurt machine. Not sure how it’ll end up, but I may need to reduce the amount of oats if I were to not strain them. This looks so good, I just bought the Kindle version of the cookbook! But I have one question — do you use sweetened or unsweetened coconut in this creamer? I always use unsweetened coconut unless it’s specified as sweetened. This stuff is amazing!! I didn’t have rolled oats so I used steel cut oats thinking it probably wouldn’t work out. I blended the oats and coconut as the recipe says. However instead of straining the blended mixture I blended it on high-power in my Vita mix for about five minutes. It came out thick and creamy and fabulous! Wow! 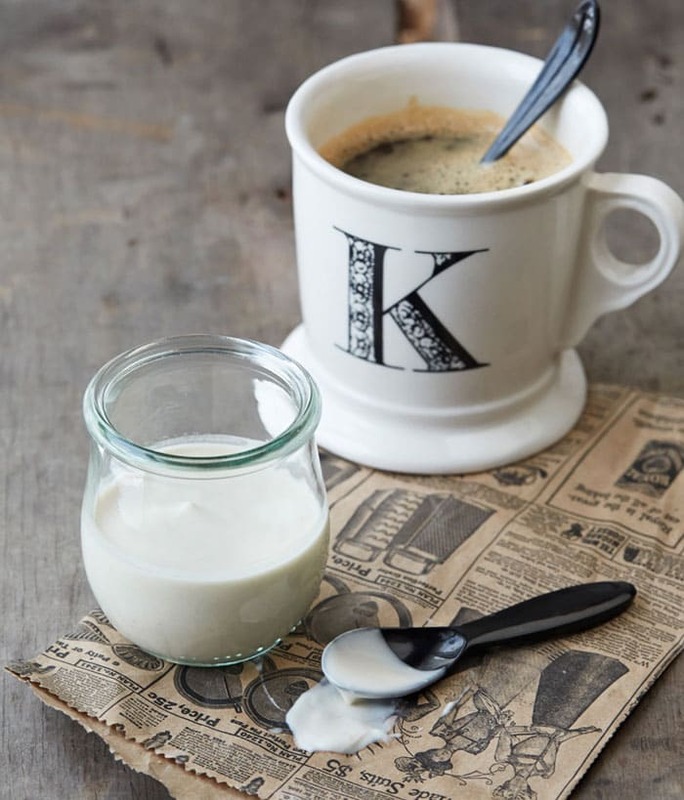 I have been exploring different homemade creamers as I don’t like all of the ingredients in store bought ones, and this one is by far the best! I’m so happy you posted it so I could try it! I used homemade date paste for the sweetener and a bit of homemade caramel. You could use extra nuts or coconut in its place. I can’t get finely shredded coconut very easily, but I can get canned coconut cream or coconut milk. Do you think it would work to use that and just less water? I do think that would work.